This will be one in a series of posts highlighting the new Cmdlets available in Windows server 2012 that didn't previously exist. I'll be breaking them down on a role-by-role (or feature) basis for easier reading. 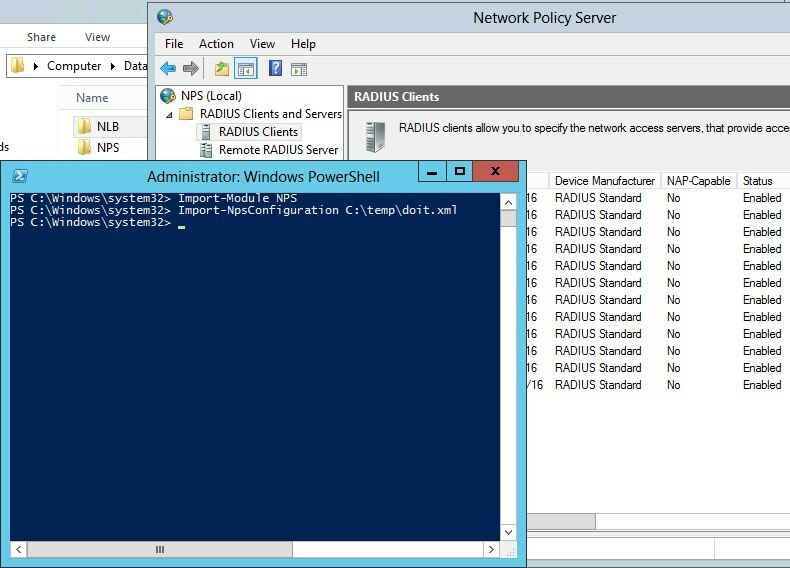 The first we'll be focusing on is the NPS server included with Windows Server, which is often used for RADIUS authentication. Get-NpsRadiusClient,Get-NpsRemediationServer,Get-NpsRemediationServerGroup,Get-NpsSharedSecretTemplate: Enumerates the Radiusclient, RemediationServer(groups), and shared secret templates on the local server. Only the Get-RemediationServer cmdlet requires an argument. The others will show all items on the server and you can use common parameters to parse. Security warning: Get-NpsSharedSecretTemplate will display shared secrets in clear text. 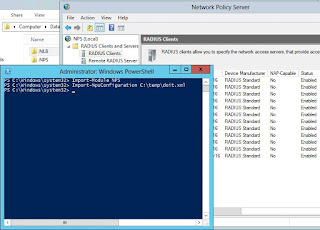 New-NpsRadiusClient -Name "NameOfMyClientGroup" -Address "10.1.0.0/16" -AuthAttributeRequired 0 -NapCompatible 0 -SharedSecret "SuperSharedSecretxyz" -VendorName "RADIUS Standard"
In the mood for some references? Me too! Any questions? Let me know. Have fun!